Heavy-duty, shop quality pedal wrench. Designed with two 15mm offset wrench openings positioned for optimal leverage and ease of use. Tool head is made of a stamped, CNC-machined, heat treated steel plate with an integrated bottle opener. 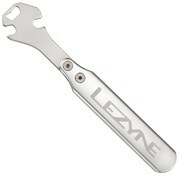 100% CNC-machined aluminum handle for strength and durability. High-strength steel fastening hardware makes this an extremely rigid and durable tool.